Coarsely chop frozen tart cherries. Let cherries thaw and drain, reserving 1 tablespoon cherry juice. 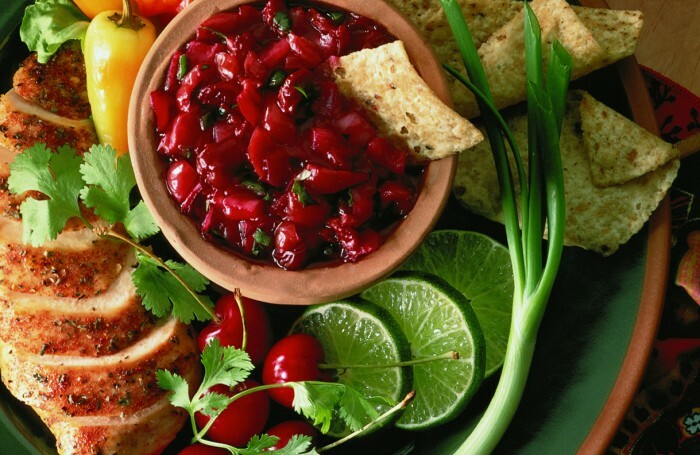 Once cherries are thawed, combine drained cherries, dried cherries, onion, jalapenos, garlic, and cilantro in a medium saucepan; mix well. Combine reserved cherry juice and cornstarch in a small bowl; mix until smooth. Stir into cherry mixture. Cook, stirring constantly, over a medium high-heat until mixture is thickened. Let cool. Serve with tortilla chips and/or cooked chicken or pork.